While GarageBand is a great tool for recording and arranging your music, it’s also packed with some great features to help you polish your mixes: GarageBand’s plugins. Plugins are essentially small bits of software which can be loaded into a DAW and can be used for mixing and sound design. This might include classic mixing tools like EQ and compression or creative effects like flanging and chorus. In addition to these effects, we have GarageBand’s Audio Unit plugins. Audio Units are simply an audio plugin format used by Apple and you might also see Audio Unit apps on iOS being referred to as Audio Unit Extensions or AUv3. In GarageBand, these can be found under the Audio Unit Extensions tab next to the plugin effects. You might have noticed that I had a few extra plug-ins in this window aside from GarageBand’s own Audio Unit effects. After a while, most music producers move beyond their DAW’s built in plugins in search of better quality or more versatile effects and this is no different on iOS. 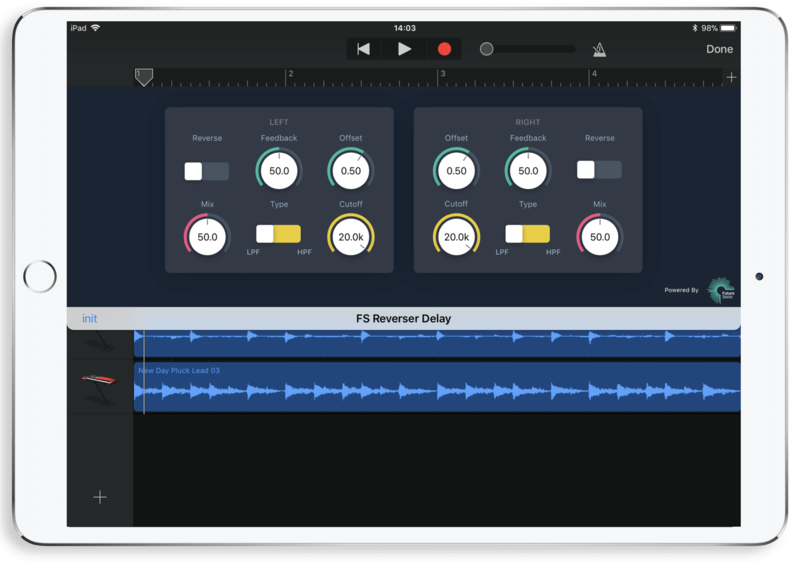 While GarageBand’s built in effects are great, there’s a whole host of Audio Unit plugins being made by third party developers that are capable of creating sounds that just aren’t possible with GarageBand’s stock effects, such as our very own FS Refraktor, FS FreezeVerb and FS Reverser Delay; details of all of our latest apps and plugins can be found on our app listings page. There’s a range of great Audio Unit (AUv3) plugins available on the App Store and the list of available apps is ever growing. For the latest releases and updates, search ‘AUv3’ on the App Store or check the Audiobus Forum. Learning how to effectively use these tools, whether you’re using third party Audio Units or GarageBand’s plug-ins is the key to taking your production skills to the next level. Any professional producer worth their salt will know their plug-ins inside out and how to effectively use them to make their mixes stand out. So if you want to take your music to the next level, mastering your plug-ins is the way to go. If you’re interested in learning more about GarageBand, why not check out our free 19 part tutorial series? Covering everything from setting up your first session to exporting your finished track.